We've all seen those great old spoons and forks in Grandma's silverware drawer, and in boxes at antique stores and flea markets. Their handles made a great canvas for art in miniature. Our artist has created a line of jewelry based on these patterns. 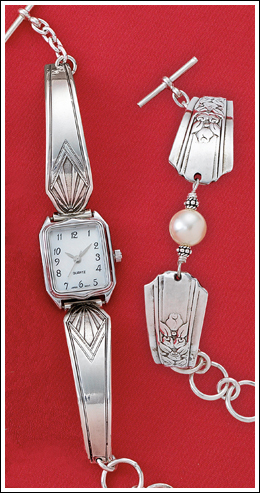 Reproduced in silver plate, our collection includes a quartz movement watch with adjustable link bracelet in an Aztec Deco design. There's also an adjustable Flower Garden design bracelet with faux pearl bead. What a wonderful thing to do to a spoon!